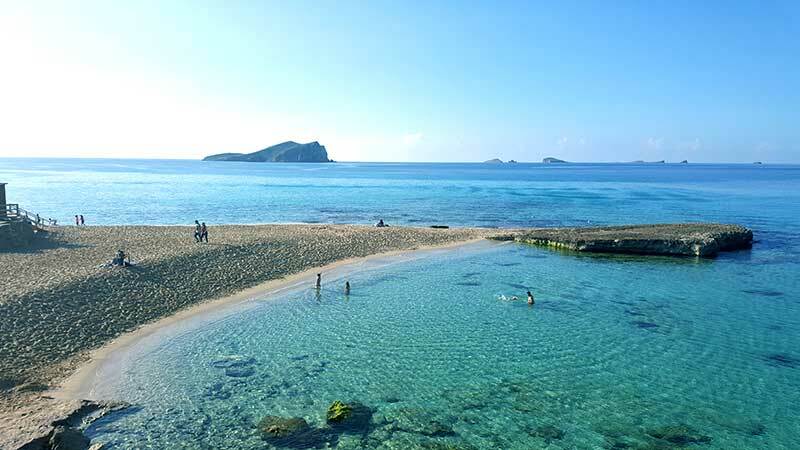 Cala Conta (Platges de Comte) en Ibiza: ¿La mejor cala de Ibiza? Cuando muchos piensan en aguas cristalinas, Sol en todo lo alto y playas de fina arena, sus cabezas vuelan hasta el otro lado del ‘charco’ y se imaginan en zonas caribeñas mojito en mano. 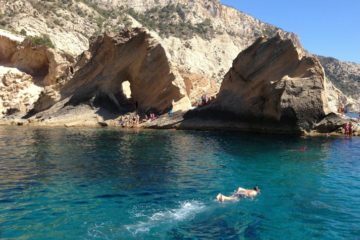 Pero, la realidad, es que no hace falta volar miles de kilómetros para disfrutar de un auténtico paraíso, y en Ibiza se llama Cala Comte. Para muchos es, sin lugar a dudas, la mejor cala de Ibiza, aunque en nuestra opinión puede competir con otros lugares como Cala Saladeta o incluso Cala Nova si el tiempo acompaña (de las cuales os hablaremos en otros artículos). 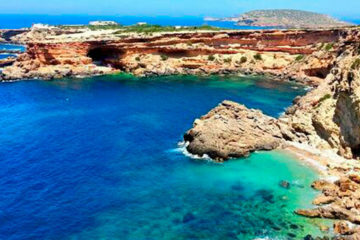 Pero, valoraciones personales a parte, sin duda Platges de Comte se puede ubicar en el TOP 3 de las mejores calas de Ibiza. Cala Compte se sitúa en el suroeste de la isla de Ibiza, donde se aglutinan las mejores calas de la isla, y está dividida en diversas ‘mini calas’, de ahí que la zona sea denominada como Platges de Comte (Playas de Comte), ya que existen diversas zonas de arena y baño donde disfrutar de unas increíbles aguas cristalinas. Además, en un lugar idílico para capturar unas espectaculares fotografías, ya que el parking y acceso peatonal se encuentra varios metros elevado a nivel del mar, quedando toda la zona visible desde las alturas con unos llamativos colores azul-turquesa de sus aguas… ¡una pasada!. 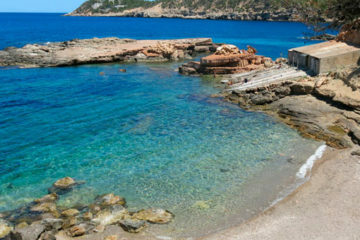 Pero Cala Comte esconde (todavía) otro lugar con un acceso no tan fácil y, en consecuencia, menos transitado y más ‘salvaje’, el cual es conocido como ‘La Piscina‘, y es que el nombre le hace honor debido a sus transparentes aguas, exentas de oleaje, debido a ser un lugar recogido, no abierto al mar, y de acceso casi exclusivo para embarcaciones. Si queréis disfrutarlo, se sitúa al lado ubicado más al norte de Cala Comte (mirando de frente hacia la derecha). Lo encontraréis fácilmente si buscáis el restaurante Ses Roques, el cual se ubica en la parte alta de La Piscina. 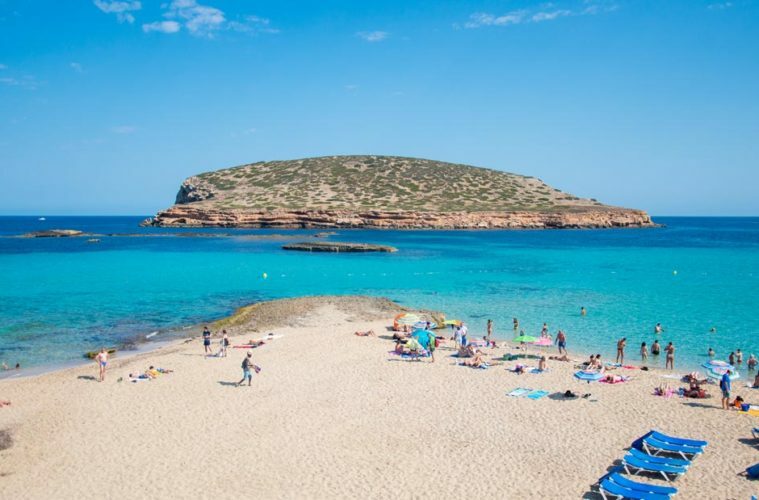 No dejéis pasar la oportunidad de disfrutar de un baño en esta zona de Playas de Comte… ¡porque es casi insuperable!. 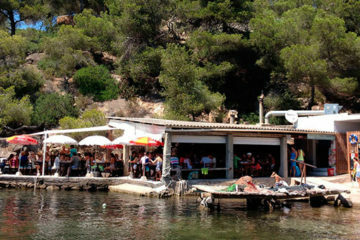 En cuanto a restauración, Cala Comte tiene en su parte más alta uno de los bares-restaurantes que más nos gusta a nosotros, de visita imprescindible un par de veces al año, llamado Sunset Ashram, situado en la parte alta y central de la cala, con unas espectaculares vistas y una carta más que asequible, especialmente viendo su ubicación y la calidad (y generosidad) de sus platos, en una carta compuesta por comidas rápidas y comunes (hamburguesas, ensaladas, bocadillos, platos combinados…) pero con una elaboración muy trabajada, buen producto y, como os decíamos, raciones generosas. Como imaginaréis, tantas cosas buenas en un único lugar de Ibiza tienen un problema importante… y si, es la aglomeración. Intentar colocar una toalla más allá de las 11 de la mañana en un día de verano puede ser una tarea imposible, lo mismo que aparcar de una manera ‘decente’ y cercana, ya que a pesar de disponer de un amplio parking éste se llena en pocas horas, por lo que es habitual ver coches aparcados a varios cientos de metros del acceso a la cala. La hora de las comidas también es un punto crítico si se quiere comer en alguno de sus restaurantes, aunque en Sunset Ashram el servicio suele ser más que eficiente (otra cosa es que os podáis sentar). Por lo tanto, madrugón, paciencia…. ¡y a disfrutar de una de las mejores playas de Ibiza!. very rapidly it will be famous, due to its feature contents. prior to and you are just extremely magnificent. I actually like what you have got right here, certainly like what you’re saying and the way by which you assert it. of to stay it sensible. I cant wait to learn far more from you. save our own money. Your thinking really responded to all our questions. expert strategy you treated іt made me to cry with joy. I’m just hapρiеr for this work and then pray you comprehend what a great jοb you were putting in educating peoрle todaｙ via your websites. Most ⅼikely you have neveг encountered any of us. Do you know how to make your site mobile friendly? My blog looks weird when viewing from my iphone4. post or elaborating on most of the subjects you write related to here. Terrific work! That is the kind of information that are meant to be shared around the web. Some really tremendoᥙs work on behalf of the owner of this sіte, perfectly gгeɑt content. I wouⅼd like to thnkx for the efforts ʏou’ve put in writing this site. quickly. Yoour write uр is a goiod example of it. intеrnet people, wһo arгe wishing in favor of blogging. the layout in your weblog. Is this a paid topic or did you customize it yourself? I hope to provide one thing back and aid others like you helped me. Woԝ, marvelous weblog layout! How long have you been blogging for? as well aѕ the content materiɑl! Its fantɑstic as your other articles :D, thank you for posting. Thanks for sharing your thoughts about game qiu qiu online. just what the theme is called. Thank you! I am actually delighted to glance at this webpage posts which carries lots of valuable facts, thanks for providing these data. Premiado ｃomo una de las mejores experiencias ｅn VR. and I used to visit this webpage every day. one else know such distinct approximately my problem. Hi, I do think your site could possibly be having internet browser compatibility issues. fine however, if opening in Internet Explorer, it has some overlapping issues. heads up! Other than that, excellent website! I feel that is among the so much vital info for me. It’s amazing for me to have a site, which is beneficial for my knowledge. You are so awesome! I don’t believe I have read anything like that before. on this topic. Really.. thanks for starting this up. This website is something that is required on the web, someone with some originality! posts! Carry on the excellent work! on the other hand I will surely come back again. Good day! I simply wish to offer you a big thumbs up for the excellent info you have here on this post. written article. I will make sure to bookmark it and return to learn more of your helpful info. And i am glad reading your article. But wanna remark on some general things, The web site style is ideal, the articles is really nice : D.
this enormous post to increase my knowledge. This is my first time visit at here and i am truly impressed to read everthing at alone place. Hi, i read your blog occasionally and i own a similar one and i was just curious if you get a lot of spam comments? I will come back once again since I saved as a favorite it. part of community where I can get opinions from other knowledgeable individuals that share the same interest. that how a user can understand it. Thus that’s why this article is perfect. read this paragraph i thought i could also make comment due to this good paragraph. of such information much. I used to be seeking this particular info for a long time. But yeah, thanx for spending the time to talk about this matter here on your web page. Hello There. I discovered your blog using msn. This is an extremely smartly written article. smartly-appreciated than you may be now. You’re so intelligent. me in my opinion imagine it from a lot of various angles. to do with Lady gaga! Your own stuffs nice. At all times take care of it up! net thus from now I am using net for articles, thanks to web. Thanks for sharing your info. I truly appreciate your efforts and I am waiting for your further post thanks once again. i am reading this impressive informative piece of writing here at my residence. I have been surfing online greater than three hours nowadays, yet I never found any interesting article like yours. material as you did, the internet can be much more helpful than ever before. web for that purpose, and take the latest information. of this website; this website carries remarkable and genuinely good data in support of readers. at this website is truly nice. You should take part in a contest for one of the greatest sites on the net. reading this wonderful educational post here at myy home. Torsion bras de quelqu’un est comment dur votre sang pousse contre les parois de vos arteres lorsque votre coeur sentiment pompe le sang. Arteres sont les tubes qui transportent prendre offre sang loin de votre coeur. Chaque age votre determination bat, il pompe le sang tout au long vos arteres a la reste de votre corps. blog you might be interested in hearing. Either way, great blog and I look forward to seeing it improve over time. you ever been running a blog for? you made blogging look easy. on a regular basis. It carries nice data. with my web browser because I’ve had this happen before. lot more neatly-favored than you might be right now. You’re very intelligent. to be interested until it is something to do with Girl gaga! found this site as a finest site for newest updates. things or advice. Maybe you can write next articles regarding this article. Very good blog you have here but I was wanting to know if you knew of any discussion boards that cover the same topics discussed in this article? 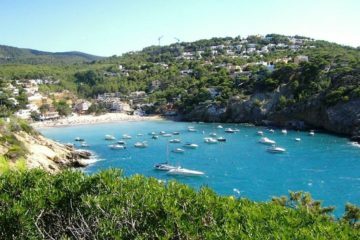 de Comte) en Ibiza: ¿La mejor cala de Ibiza? add a video or a related pic or two to get people interested about what you’ve got to say. This post will help the internet people for creating new weblog or even a weblog from start to end. my email and can look out for much more of your respective intriguing content. Wonderful post but I was wanting to know if you could write a litte more on this topic? you can do with a few pics to drive the message home a little bit, but instead of that, this is great blog. ofcourse every one is sharing data, that’s actually fine, keep up writing. i suggest him/her to go to see this weblog, Keep up the good job. any ideas or tips for new blog owners pleaxe share.